Ahead of a British Psychological Society supported meeting of the All Party Parliamentary Group for Psychology, our journalist Ella Rhodes meets some of the speakers. On 18 July, the All Party Parliamentary Group (APPG) for Psychology is due to meet for the fifth time at the Houses of Parliament, to discuss mental health in the criminal justice system. The speakers will include a neuropsychologist, forensic and clinical psychologists, covering the links between brain injury and crime, the potentially protective role of the secure estate in supporting children and young people, and the effects of traumatic material on civilian police staff. Clinical Psychologist Dr Jenny Taylor, who has worked extensively with young offenders in the community and secure settings, will be talking about her work on mental health provision for children and young people in the secure estate – which includes prisons for young people and secure children’s homes. She said there needs to be a rethink in the use of secure and custodial settings as a way to address anti-social behaviour in children and young people as they have little power to change someone’s home and peer environment. Taylor said that in many settings applied psychology is only offered to children and young people who have a diagnosable mental health condition. She suggested we need to move away from this way of thinking, and instead accept that anyone society has deemed unmanageable and locked away before the age of 18 will have significant problems with their psychological development and should have access to specialist expertise. Training staff to communicate with these young people in the most helpful way, especially those who spend the most time with them such as prison officers, would be the best route to improving the services currently on offer. Associate Professor of Clinical Neuropsychology and Co-Director of the Centre for Clinical Neuropsychology Research, Professor Huw Williams (University of Exeter), has researched the links between traumatic brain injury (TBI) and entry into the criminal justice system. He will discuss some of his research, including findings that rates of TBI are three to four times higher in the prison population compared with the general population. Head injuries are linked to earlier entry into the criminal justice system, and more violent offending. Co-Director of the Centre for Crime, Justice and Policing and Director of the Centre for Applied Psychology (University of Birmingham), Professor Jessica Woodhams, has spent most of her career working with UK and international police forces. She has explored the impact of exposure to traumatic material on those who work within the police but in back-office based roles such as crime analysts and call handlers. - Find out more about the Society's work with the APPG for Psychology. Read our previous reports from APPG on Psychology meetings; see our Research Digest round up on the mental health of prisoners, and revisit our March 2016 special. 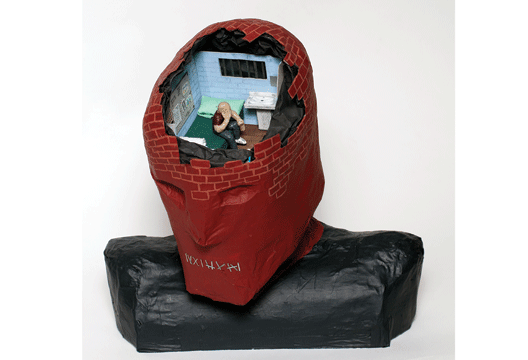 Image from an inmate at HM Prison Winchester, courtesy of the Koestler Trust.